A nation is its institutions. If those institutions are overrun and no longer exist, so too does the nation itself cease to exist. Institutions range from the offices of government, to education, to agricultural and economic development, to the management of natural resources, national infrastructure including energy and transportation, and security. These are the things we think about when we think about the concept of a modern nation-state. The CPA assumed responsibility for all aspects of life in Iraq, from the privatization of Iraq’s economy, to “reconstruction,” to reorganizing the nation socially, politically, and economically. The average onlooker will remember US President George Bush’s “shock and awe,” and may remember several of the more notorious battles of the invasion and subsequent occupation. What they rarely recall is the all encompassing dominion the US assumed over the nation through the CPA which was merely underpinned by US military forces. Yet despite the relatively dull nature of the CPA’s work versus security operations carried out by American forces, the CPA is what essentially “occupied” and ultimately conquered Iraq. Iraq and Afghanistan are extreme examples of the US exercising global hegemony, which included spectacular, full-scale military invasions, lengthy occupations, and nationwide “nation-building” carried out by various organizations utilized by the US to project power abroad. One of these organizations is USAID. It should be, but rarely is, troubling to the world’s nations that USAID played an integral part in the invasion, occupation, and conquest of Iraq and Afghanistan, while it also maintains an extensive presence everywhere else US interests have directed their attention. USAID and a virtual army of nongovernmental organizations (NGOs) and front-companies it supports worldwide, are engaged in activities in other nations ranging from education, energy, natural resources, economic development, transportation, and security – or in other words everything foreign nations should already be attending to themselves. USAID does not seek to genuinely partner with foreign governments, but instead, create networks that operate independently of and parallel to existing, indigenous institutions and networks. USAID and its expanding network of facilitators extends into any given nation, slowly assuming responsibility over all areas a sovereign government should be managing, leaving existing governments irrelevant, empty shells. When parallel networks gain critical mass, they can then be used as a means of removing existing governments from power, and installing a client regime in its place – one that answers to the special interests that sponsored and directed USAID’s activities to begin with. USAID actively seeks to co-opt local talent – both individually and small groups of talented individuals. They generally target start-ups and independent NGOs which is why USAID and other US government-funded NGOs are increasingly engaged in co-working spaces – even sponsoring the creation and management of new spaces across the developing world to create a convenient poaching ground for local talent. 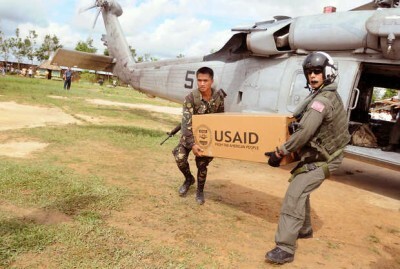 USAID does not exist to “aid” anyone. It functions solely to overrun a targeted nation by building their networks over existing indigenous ones, turning a nation’s people against itself, and making preexisting networks irrelevant. They are essentially filling up the sociopolitical, geostrategic, technological, and information space with their own influence, displacing all else. Unlike the Western game of chess, where players seek to eliminate their opponent’s pieces from the board in a game of strategic attrition, USAID and other organizations like it and the strategy they are pursuing is more comparable to the Eastern game of go. In go, players seek to place as many pieces as possible onto the board, assuming control over the most territory. In this context, any nation could represent a board, with its own pieces scattered across it in areas like energy, education, healthcare, and security. USAID seeks to place its own pieces on this board, generally under the guise of charity or foreign aid. It continues placing its pieces on the board, backed with inexhaustible resources and the benefit of its true intentions often being poorly understood by the governments and the people of the nations it is operating in. The US through USAID is essentially playing a game of go against an unskilled player who doesn’t even know the game has begun. USAID is then able to quickly and easily overwhelm the board with its “pieces” – NGOs it funds, organizations and talent it has co-opted, and entirely parallel institutions running various aspects of a targeted nation right under the nose of that nation’s government. In coordination with other US State Department-funded political fronts and NGOs, the business of then eliminating indigenous institutions and overthrowing established governments in favor of proxy institutions run by Western interests and client regimes bent to the will of the US, can begin in earnest. Targeted nations often realize too late that the “space” on the board has been dominated by these foreign interests with whatever remains of indigenous institutions and networks so badly neglected and atrophied, they stand little chance of putting up any resistance. USAID’s version of “go” has its own rule book of sorts, found easily online as free downloads from any number of US government websites in the form of counterinsurgency manuals. In these manuals, it is described how gaining control over any given population requires controlling the basic essentials that population depends on – everything from energy production to education, to garbage collection and job creation. By controlling these aspects in any given population, one then controls that population itself. It is the key to not only defeating an “insurgency,” it is also the key to running a successful insurgency oneself. USAID projecting its influence into any given nation is in fact a sort of insurgency – a literal attempt to take control of a government – however incremental and patient the nature of that insurgency might be. When inquiring into how many of these are regularly included in USAID programs, the answer is virtually all of them. For any given nation, USAID should be listed as a foreign agency and its activities heavily restricted. Every penny they administer, if allowed to operate at all, should go straight into government programs. USAID programs should be made subordinate to government institutions, carried out by government institutions, and its role in such programs credited subordinately to government institutions. USAID should be strictly forbidden to operate independent networks, programs, workshops, contests, and meetings anywhere beyond America’s borders. But more importantly, nations must understand the “go” board their territory and populations represent. They must create and place their own superior pieces upon this board in such numbers and of such quality that there is no room for USAID’s pieces to begin with. By doing so, a nation is not just countering USAID and the conspiracy it represents, it is defeating it at the most fundamental level this “game” is being played. A nation creating strong institutions and networks within their own borders to manage and move forward those areas essential to the progress of modern civilization precludes the need for “foreign aid” in the first place. It is not just a matter of pride that a nation need not rely on “foreign aid,” but a matter of its survival, as “aid” is not given freely, and as in the case of USAID, serves as a vector for hegemony’s projection into the very heart of one’s nation.